I am deeply regretful for the people who were forced to leave their homes due to terrorist attacks and for the shortage of the security forces in giving sufficient protection. 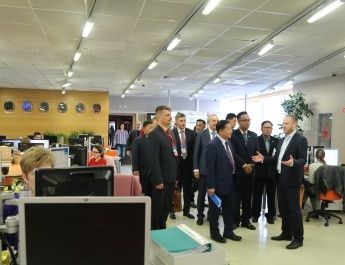 The public cooperation and participation is important in taking security measures. 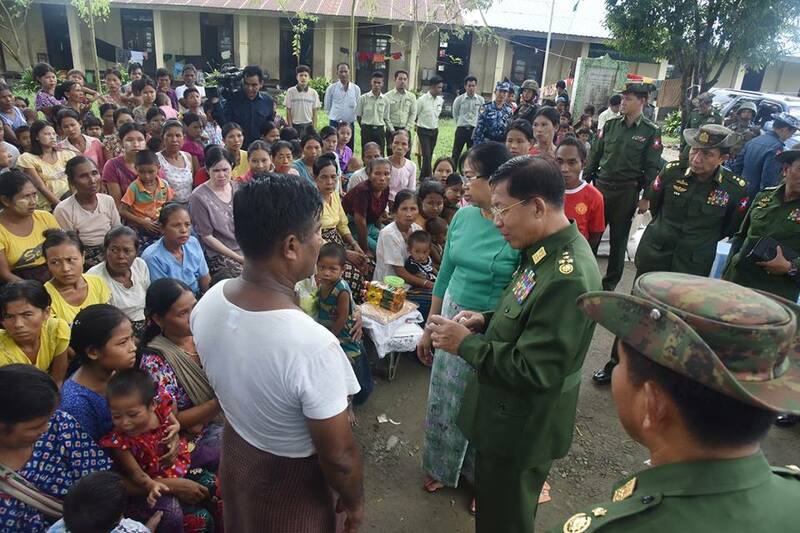 Local ethnics can strengthen the defence prowess by living in unity and by joining hands with the administrative bodies and security forces in oneness, said Commander-in-Chief of Defence Services Senior General Min Aung Hlaing at his meeting with the ethnic people who fled their homes and are taking refuge at Aungmyay Bodi Sasana Yeiktha in Maungtaw due to the brutal attacks of the extremist Bengali terrorists. 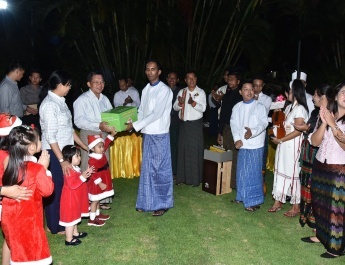 Senior General Min Aung Hlaing, accompanied by wife Daw Kyu Kyu Hla, Union Minister for Home Affairs Lt-Gen Kyaw Swe, Union Minister for Border Affairs Lt-Gen Ye Aung, Commander-in-Chief (Air) General Khin Aung Myint, senior military offi cers of the Offi ce of the Commander-in-Chief and the commander of Western Command, met with local ethnics taking refuge at Aungmyay Bodi Sasana Yeiktha in the morning. At the meeting the Senior General said local ethnics had to leave their homes due to the inequality in strength and lifethreatening situation during the incident in which extremist Bengali terrorists used forces in launching terrorist attacks against security forces carrying out area protection on 25 August. The arrival of Tatmadaw troops in advance in the area for clearance operations was helpful in protecting the lives of the ethnic races. Some quarters including the UN are exerting a lot of pressure on the Tatmadaw for using troops in the area clearance operations. So we are taking careful measures within the framework of the law and rules. There are some people who are criticizing or having negative view on the use of military personnel. But we are the ones who know about our country or our situation best. Locals and teachers who fl ed Ngayechaung, Indin, Pyatha and Taungpyoletwei villages and the persons doing volunteer services in Alodawoyi monastery explained their experiences during the terrorist attacks, the need to provide them with protection as the population of the Bengali villages in the surrounding area is much larger than theirs, the removal of the remaining Bengalis in the area, poor transport, livelihood difficulties and the requirement of a strong border fence. The Senior General said it is necessary for local ethnics not to abandon their places and villages and return there without fail. And the Tatmadaw will prioritize their security. The Union government and the state government will be advised with regard to the resettlement of villages. The current population ratio of local ethnics to Bengalis is totally reverse compared with that of the past. For possession of businesses, they were hired workers when the native people owned businesses. But due to various reasons, they have become owners now. Therefore, it is required to consider for a long term by taking lesson from this. As educated persons are needed for regional development, children should be encouraged to go to schools opened in the region. 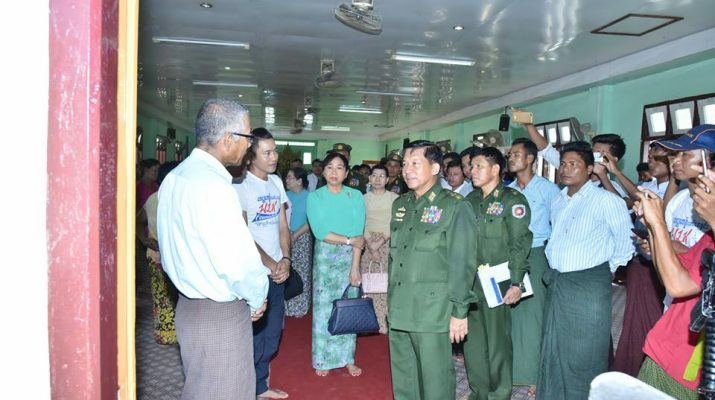 The Tatmadaw will cooperate with concerned offi cials for better transport and secure border fencing. Ethnic people need to unite with each other. Cooperation is also necessary with regional administrative bodies and security organizations. It is required to monitor who is responsible for large seizures of narcotic drugs in Rakhine State. The Senior General stressed the need for all to prevent this, to give tip-offs and not to encourage drug trafficking. 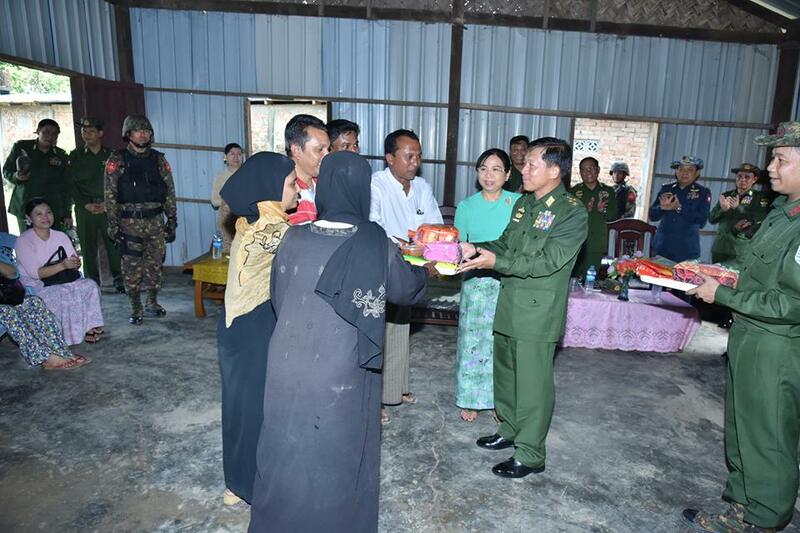 After the meeting, the Senior General and wife presented foods and relief supplies to the local people and cordially greeted them. 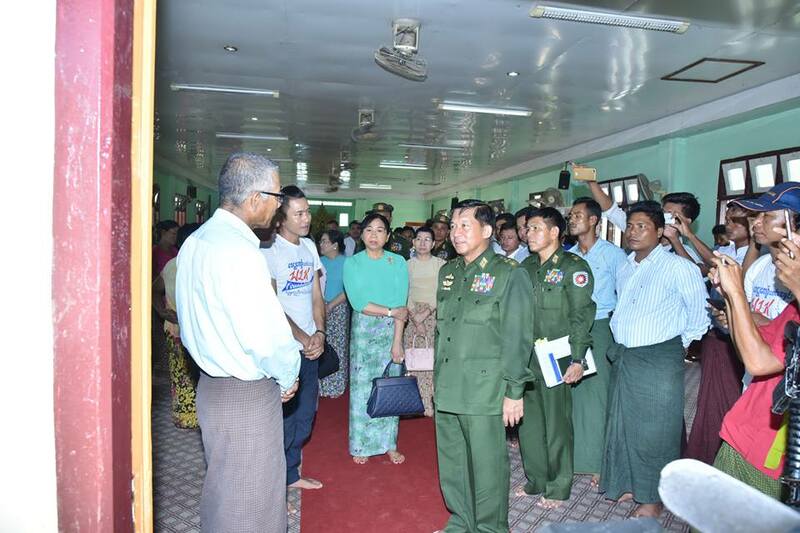 Then, the Senior General separately met with displaced Hindus staying at Maungtaw Basic Education High School and displaced Bengalis staying at the hall of Prime School (Myoma Kanyintan). In the meetings, the Senior General stressed the need for them to live in unity, to follow the laws, rules and disciplines enacted by the State, to live and earn in line with those laws and rules and to report to relevant administrative bodies and security organizations about any violation of the laws, rules and disciplines. Then the Senior General and wife presented relief supplies. The Senior General and party inspected Border Checkpoint (1). Later, they visited and encouraged the local ethnic people such as Daingnet, Mro and Thet who are taking shelter at No (2) Basic Education School Branch (fourth mile) after fleeing from nearby villages. The Senior General and wife presented them with relief supplies.